"The Journey II" is back! Finally, players using Symbian Touchscreen smartphones scan experience how the story of "The Journey I" continues: "The Journey II" is available in the Nokia Store! Search for the game now on your Nokia smartphone, or check out the game on your PC on the Nokia Store website. "The Journey II" for Symbian Touch Smartphones! Around 1.5 million people have already lived through the beginning of the enthralling detective story of the first part of the location-based adventure game saga. Now, the successor has finally been adapted for the latest Symbian Touch-Smartphones of Nokia. All the in-game graphics have been adapted for current, brilliant high resolution screens. Through this, it's now finally possible to experience the birth of location based adventure games (first release in 2004) in an up-to-date environment. "The Journey II" will soon be available in the Ovi Store! A new release of "The Journey I" is now available in the Ovi Store. The update to v1.40 is only relevant for touchscreen devices and features a new icon following the style of Symbian Anna, plus minor bugfixes with regards to menu handling. For non-touch devices, version 1.33 (S60 3rd and 5th Edition) / 1.13 (Series 60 1st and 2nd Edition) are still available. Starting with today, version 1.33 of "The Journey" is available for S60 3rd and 5th Edition devices. It removes the compatibility warning during installation on 5th Edition devices that was shown with the previous release. Additionally, a short introductionary text explains the general game concept when first starting the game. Plus: the ingame text of the German and English version has been slightly improved. You can download the new Symbian Signed version plus the source code from the download section or search for the game on the Ovi Store. To make the game compatible to the touch screen phones based on S60 5th Edition, "The Journey" has been updated to v1.32. The new release combines support for both touch and non-touch phones. The game is Symbian Signed and can therefore be installed on all compatible phones. As usual, the updated source code is available for free download (licensed under GPL v3). To download "The Journey", either head over to the download section or search for the game on the Ovi Store. "The Journey" is now officially available for S60 3rd Edition phones! The signing process is finally completed and you can now download the Symbian Signed version of "The Journey" (v1.21). The source code project of the game has been updated to Carbide.c++ 1.2, so it's now possible to compile the multi-language version of the game through the IDE. 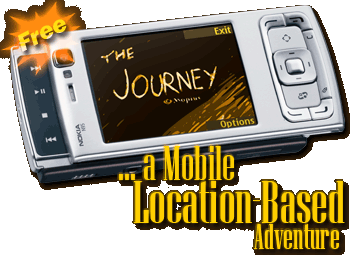 The previous version of "The Journey" for S60 1st and 2nd Edition phones (v1.13) is still available. Good news - the new version of "The Journey" is finally available for download and fully compatible to all S60 3rd Edition devices! Download your copy now!! Now to the bad news - Symbian Signed for freeware applications takes some months to sign an application... Therefore, the current release of the game has to be self-signed by you. This requires some technical expertise, but there is no other choice until the final new version of the game is finally signed. Find a link to instructions in the downloadable archive. Stay tuned for the official release of the new version! Once the application is finally Symbian Signed, the homepage will also be updated to reflect the updated and much better looking vector graphics of the game! Numerous requests have been sent to us, asking to port "The Journey" (which has as of now been downloaded more than 70.000 times) to the new version of Symbian OS and S60 so that it can run on the latest mobile devices. The good news is that we can now publically announce that the porting process of the game is already nearly finished! Even better than that, it's more than a simple port; many parts of the game have been rewritten and it also features better graphics. Finally, the best thing is that it will not only be released as Freeware, but also as an Open Source-application (again). The new version of the game will go public after it passes the Symbian Signed tests, which are now required to get the location information - so stay tuned! The next location based entertainment application made by Andreas Jakl is getting ready! RealReplay brings thrilling real-life race competitions directly to your mobile phone. Using a GPS receiver, you can not only record your own virtual race tracks in your real surroundings, but also compete against replays of races previously recorded by other players! After the enormous success of "The Journey", which was downloaded more than 15,000 times, received several awards and was featured on TV, the successor is finally finished! While part one was made to demonstrate the innovative location based adventure concept, "The Journey II" takes this concept to maturity. It adds a whole virtual world with full interactivity and lets the player decide what to do next and where to go next. Now there is no excuse to still sit around somewhere while playing mobile games, it's time you get active! The new game will give you plenty of room for that. During several hours of playing time, you will have to follow many clues to uncover the truth about the exciting and dangerous happenings. Download The Journey II now! "The Journey" is now available in three languages: English, German and Russian. The new translation was done by [wl], thanks for his great work and support! The download page has been updated, the source code of the new version (1.13) is also available. My own experience with Journey was a great one. [...] it actually was quite fun and kept me entertained for most of the next afternoon as I marched back and forth around the real city finding people (in game) and sometimes being found by them. [...] for free I consider it a must try and highly recommend it. The application is a good mix between simplicity and innovation. The game is a little bit short but try it: this is something you have probably never seen on your mobile phone. The code is very interesting to study for a beginner to medium experienced developer and has been well documented. The game has been awarded with great prizes, more information can be found on the results page at NewLC. The Austrian television channel ORF is currently producing a 4 minute report about The Journey. It is planned that it will be aired on ORF1 between 18:30 and 19:00 on Monday, September 27th. Based on the basic principle of the game which mixes virtuality with reality, the game is presented by an actor. He plays the game on his mobile phone, disguised as a detective, and lives through the whole story. At the end he is no longer sure about the seperation of fiction and reality. During the interview the possible future of location based games is being talked about, as well as how the idea of The Journey evolved and made it into a real game. The successor to The Journey is nearly finished. The game engine is already working very well and will go into beta phase in a few days. Come back soon to read more about the new features, enhanced interactivity and other improvements that you requested and that were put into reality! The jury, consisting of people from Symbian LTD and the community, has chosen 11 applications and games that qualify for the finals of the "Open Summer '04 - Open Source Symbian Developer Contest". The Journey is one of the finalists, the official ranking will be presented at the Symbian Expo at October 4th-5th. Read more about it at NewLC! Mopius is part of the Europrix Award as one of the top talent teams. Out of 414 projects from 29 countries, The Journey is nominated along with 22 other projects. It will be presented at the Europrix Festival in Vienna from November, 19th to 21st. Among other activities, the project will be showcased at the Technical Museum of Vienna. “The Journey” offers a new challenge for all who would like to play the role of Philip Marlow – in a modern, gloomy world. The jury was convinced by the professional presentation and the well implemented demonstration and is anxious to see the further development of the project. © 2004 Andreas Jakl. All Rights Reserved.